Dont base your opinion on the reviews before this...... YES it repeats a lot of information laid out previously! but as a first time listener it still has the ability to twist what you thought was coming!!!!!!!! No confessions necessary. This was awful. Try Eragon instead. To be honest, you could probably skip this entire book and believe that everything turns out alright in the end. The sheer quantity of repetition and rephrasing of the same talking points from ALL the other books was numbing. The concepts weren't particularly deep and the characters weren't particularly complex, so I truly didn't understand the need for beating the listener over the head with every narrative point. One of the most disappointing (and overly long!) books I've rented. Truly a fantastic story. What a way to wrap it all up. I had so much fun reading all the novels and getting myself all immersed in Richard Rahl. I cant wait till the tv series starts in August of this year. 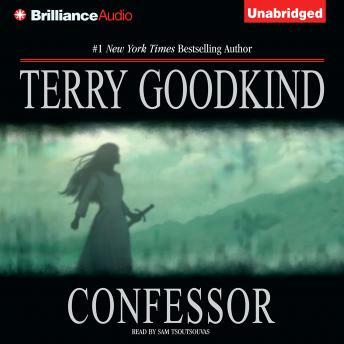 Once again Terry Goodkind delivers! One thing I've noticed with other authors as story lines stretch across multiple novels is a loss of story clarity and muddied plot lines. Not so here. The plot lines remain clear, the story flows at a nice pace, and the characters become even more solid in the mind of the reader. Another reviewer likened the stories message to those in Ayn Rand novels and the parallel is a good one. Sword and sorcery and a deeper message? Can't ask for more.